Sometimes the output of your head unit just won't cut it. If you've got yourself some new speakers and are dissapointed at the sound they produce, you may be in need for some good old amplification. A good two channel amp will fit the needs of many, so let's go and find out the best choices available around. Also, I'd advise you to check out some more versatile choices like 4 channel and 5 channel amps in case you intend to expand your car audio setup in the future. Starting on the high-end side of the spectrum, we have the Audison AV Due. This amplifier offers plenty of RMS power for bridging your signal at 4-ohms, and it can also drive 2 speaker channels at 2-ohms or 4-ohms with ease. This is a good resource to understand amps and channels better. If you have already have a set of high end full range speakers or a pair of subwoofers that need more juice to get the best sound, this is the 2-channel amplifier that will get you there, and without any worries about bridging multiple amplifiers. First timers should exercise caution when bridging any 2-channel amp, as failure to connect everything in the correct sequence can damage your speakers and subs. Be sure you read the owner’s manual for this amp and your speakers and subwoofers carefully before connecting in a bridge configuration. Users who plan to bridge this amplifier with another amp in order to boost power output need to be cautious to ensure they making all the correct connections without accidentally damaging their other car audio gear. Like all things Focal manufacturers, this a powerful 2-channel amplifier that is built to exacting standards with multiple fail safes to protect your investment and your other audio gear. Here’s what makes the Focal FPS 2160 such a fantastic little component to boost your car stereo’s performance. The best features of this amp are hands down the amount of power handling, how easy it is to bridge, and the self-cooling system. Running this amp for two high-end door speakers brings the real power and clarity out of your car’s stereo system thanks to the higher RMS wattage output. Additionally, this amp was practically built from the ground up to bridge signal for increased power output per channel. My absolute favorite feature though is the automated thermostat controlled cooling fan, as that is a must-have feature in any high-powered car amplifier setup. More than likely, you are going to want two of these to run your stereo for front and rear, or for powering your door speakers and a sub kit. On its own, this amp can’t really throw enough wattage to power a pair of high end subs, or even one powerful 15” subwoofer without straining. Underpowered for most subwoofer setups, may want to bridge two of these for front and rear speakers or doors and sub kit. Pioneer delivers some of the best available 2-channel power amplification in an attractive, compact design. Check out all there is to love about the GM-A5602. First of all, the RMS power for each speaker channel is excellent. Even low-end speakers sound amazing when powered by this amplifier, and they can make any high end car audio kit really shine. Additionally, the built in crossovers allow you to dial in the exact sound you want from each speaker channel, too. 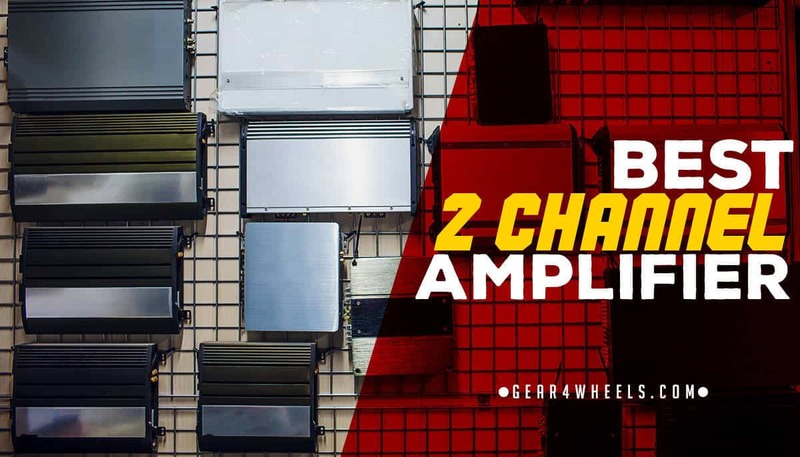 Best of all, thanks to their easy bridging capabilities, these amplifiers can be used to run powerful subwoofer kits as well as door speakers, so a pair of GM-A5602s is a winning combination for any premium car audio setup. Not much to complain about here, though this amp could benefit from an automated cooling fan system instead of a continuous fan setup, though honestly if you can hear the fans over your speakers the amp isn’t doing its job anyway. That’s all the criticism I have. Cooling fan runs continuously as opposed to being thermostat controlled. Trying to boost your audio quality and power on a budget? The Rockford Fosgate R150X2 may be just the amp you’ve been looking for with decent power handling and easy to use and configure features. This little amp provides decent power for smaller car door speakers in need of a boost, and it will run smaller subwoofer kits fairly easily as well. The built-in bass boost and EQ also let you dial in your sound just the way you like it. The R150X2 doesn’t really work well with higher powered car speakers, and it will only drive smaller subwoofers. It gives your audio a boost, but it’s also a very small boost. Additionally, this amp uses heatsink cooling as opposed to a thermostat controlled fan, so mounting it in a tight space may cause overheating. JL Audio has a decent mid-tier amplifier in JX360/2. It’s powerful enough to drive most aftermarket car speakers, and can even drive smaller subwoofer kits if bridged properly. This is a great mid-tier starter amp for those looking to add some “oomph” to their car speakers without having to spend a month’s pay. The RMS handling is great for after-market car speakers that draw more than the typical head unit can push out, and when running several of these amps together to boost power, they can make your car stereo sound truly awe-inspiring. These are decent amps for full range speakers, but they have to be run on a 14-volt system in order to get the most out of them. Additionally, they really are a little wimpy for driving subwoofers unless you are bridging several of them. They are also heatsink cooled, which means placement and mounting is a factor if you want to prevent overheating. Out of all these amplifiers, the one that is the standout best value is definitely the Audison AV Due. Nothing else comes close to providing the capability, quality, and functionality of this piece by Audison. I feel confident recommending it as the best 2 channel amp of 2017, even though the price point is a bit over the top. Whether you are using them to drive powerful subwoofer kits or just adding some extra punch to your door speakers, these amps fit the bill beautifully.